LAS VEGAS, NV--(Marketwired - January 06, 2015) - Monoprice, an e-commerce leader that offers exceptional quality consumer electronics and tech gear at prices much lower than those of their competitors, today announced the release of a new suite of innovative tech solutions at the 2015 Consumer Electronics Show (CES). Featuring the latest advancements in hardware design and technology integration, Monoprice continues to disrupt the status quo by delivering premium products at affordable price points. "We pride ourselves on keeping our finger on the pulse of technology trends and continuously introducing the most sought-after consumer electronics at fair prices," said Bernard Luthi, President of Monoprice. "CES is the perfect launchpad for all of our latest innovations, including key items in the rapidly advancing home security and display technology categories." [EDITOR'S NOTE: The price quoted above is inaccurate. The monitor is currently selling for $799.06. The press release also states that the monitor will deliver 2,048 levels of pressure, but the website states that the device offers 1,024 levels of pressure. The names in the box image and release also don't exactly match the name on the site. Apologies for any confusion. Monoprice also released a new non-touch version of the monitor, the 22in HD Interactive Pen Drawing Display, which retails for $598. This model looks very similar to the Huion GT-220, which is now selling for $799 on Amazon. After last year's release of the Monoprice Interactive Pen Display, based on Huion's GT-190, I've been expecting the company to follow suit with its version of the updated GT-220. The Rancho Cucamonga, CA company known for its low-priced products will not disappoint if its Facebook page is to be believed. They are now teasing two new 22-inch pen displays: one for $499 and a second with multi-touch for only $599. The latter would be the first multi-touch pen display from anyone other than Wacom, whose Cintiq 22HD Touch retails for $2499. Last year's 19-inch Monoprice pen display was hampered by its TFT screen, but if the new models are spec'd similarly to the Huion GT-220, which retails for $1000, they will simply be a no-brainer. No word from the firm regarding availability dates. The Monoprice Interactive Pen Display: what a difference some driver tweaks make. The sub-$400 Monoprice Interactive Pen Display was probably one of the most anticipated releases of 2013 and the posts I wrote at the time continue to be among my most widely read ever. Everyone loves a bargain, especially starving artists. In the event you haven’t read those posts, I concluded back in January that the budget 19-inch tablet monitor just wasn’t worth the investment due to terrible viewing angles and very inferior pen drivers. A couple of months ago, Twitter follower @Drewvis let me know that Monoprice had posted new device drivers on its site. He also mentioned that attaching the pen display via DVI (rather than VGA) had yielded dramatically better viewing angles. Drewvis recently published his own review of the tablet monitor which you can find here: http://astrowagon.tumblr.com/post/89350457697/final-review-monoprice-19-interactive-pen-display. Somewhat skeptically, I took the Monoprice out of mothballs and attached it to my desktop via DVI. At first I didn’t notice much improvement. In addition to its limited view angles, the pen display’s screen is highly reflective, so I had to be careful to angle it so that it didn’t reflect too much of my white ceilings. Next, I cranked up the brightness of the monitor to cut down on reflections. Reflections are a real problem during the day in my brightly lit office, so I also switched to white user interfaces rather than my preferred dark settings. And lo and behold, the monitor is indeed more useable. Where once I could only find what seemed to be one angle to view the screen, I now had a wider field of view to work within. This chart illustrating the viewing angles for the Monoprice Interactive Pen Display are far too generous, but with a DVI connection, the field of view is wider than I originally observed via VGA. According to this graphic on the Monoprice site, the pen display has a 70-degree view horizontally and vertically. I think they’re being generous (perhaps it’s closer to 50), but anything is better than one degree! Connected via DVI, it’s now possible to recline the monitor so that I can draw at a more comfortable angle. Previously, I had to stand it almost vertically (at its maximum 80-degrees) to be able to see my drawing clearly. The monitor will recline all the way to 10-degrees, but I’ve found that about a 60-degree incline is sufficient to rest my hand and preserve picture quality. This is not a choice one should have to make, but you have to expect some sacrifices at this price point. And it certainly beats having to purchase a full-motion monitor desk mount. Getting the drivers to work is not easy. I uninstalled the Monoprice driver and rebooted, also unplugging the USB cable that runs from the computer to the tablet monitor. I installed the GT-190 drivers and rebooted again. Once I was back on my desktop, I plugged in the USB cable. The tablet driver should have already started up, but in case it hasn’t, the installation leaves an icon on your desktop. Once the driver is running, you’ll need to double click on the tablet driver icon in the system tray to load the control panel. 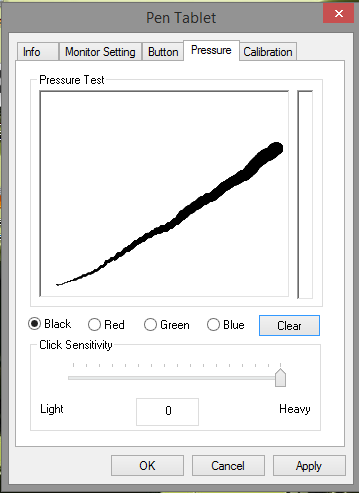 Beneath the pressure (tip) sensitivity slider in the pen control panel is a visual read-out that makes it much easier to determine how much pressure the pen is registering. I could slide the sensitivity all the way to the right to register my lightest strokes, but I opted to back off just a bit so I wouldn't have to press quite as hard to achieve maximum pressure. At the top of the control panel, you can map your two pen buttons and set tip sensitivity. There is a nice visual display that displays how much of an impression you are making as you tap with your pen. This makes it much easier to visualize how lightly you can tap before your pen will register a mark. I could have set my pen pressure all the way to the right, but I didn’t want to have to press so hard to achieve 100% pressure. In order to access the pen-monitor calibration tool, you'll first have to grant the control panel Administrative access. To calibrate your monitor, you’ll first need to select the Require Admin button. Even if your pen is recognized, you will always need to start the calibration process with your mouse. The calibration tool has five points, all located toward the center of the display. This is unfortunate because parallax tends to increase as you get toward the edges of your screen. It's unfortunate that pen calibration targets are all clustered near the center of the screen. In earlier, broken versions of the driver, Huion offered many more higher-resolution calibration options. As of now, I'm seeing significant parallax around the edges of the display which sometimes makes selecting menus and icons located there difficult. The pen targets go from red to black as you tap them. When you tap the fifth target in the center of the display, the control panel exits. As I wrote when I first tested the Monoprice, it’s a delight to finally draw with the pen configured properly. I can achieve a range of line widths in a single stroke that I’m unable to reproduce on either the Wacom Surface Pros or the N-Trig Surface Pro 3. Pressure levels may be a marketing ploy, but there’s a tangible difference in drawing with the two 2048-level devices I’ve used vs. 1024 or 256. The last reservation I had against recommending the Monoprice was its inability to work in dual monitor mode in Windows. This meant that you either had to connect it by itself or in mirror mode with your system monitor. Due to the pen display’s low resolution (1440x900 max), this probably meant you’d have to run your other monitor in a sub-optimal setting. With the new driver, it’s now possible to run the pen display in extended mode at its own resolution. This is a huge improvement. On my puny GeForce GT 630 display, the NVidia driver doesn’t offer 1440x900 as a display option, so I had to set the Monoprice to 1280x800. Not ideal, but this setting doesn’t distort text too badly. To set up two monitors, I first disconnected my system monitor and ran all of the above set up with the pen display as my sole monitor. Once I was sure the display was calibrated and the pen was running well, I shut down the system and reattached the system monitor. My NVidia graphics card doesn't recognize or support the Monoprice's 1440x900 resolution, so I'm forced to run it at 1280 x 800. The good news is that I can continue to run my system monitor at its full 1080p resolution. Upon boot up, I ran the Screen Resolution control panel to extend the displays and set each monitor’s resolution. So a little over six months after its release, the Monoprice Interactive Pen Display is now much more useable and I can recommend it to anyone willing to put up with its eccentricities in exchange for significant savings vs. competing products. If you’ve got just under $1000 to spend, I’d still recommend the Yiynova MVP22U(v2). Yiynova also sells the MSP19U+ for just over $600 (but I’ve never seen or tested it first hand). The latter’s display specs are very similar to the Monoprice (TFT, 1440x900), so it’s very difficult to justify an additional $200 investment. The Monoprice certainly compares favorably to a large Intuos Pro Pen & Touch, which lists for $499. And for only $50 more than the Medium sized Intuos, the Interactive Pen Display is an excellent option. As with all things tech, a better version is probably around the corner, but for the next few months at least, the Monoprice Interactive Pen Display has earned a spot on my crowded desktop. The Monoprice Interactive Pen Display will only work for Windows artists who set their expectations low and are willing to adapt their workflow around this low-cost hardware. It’s been almost two months since I first received my 19-inch Monoprice Interactive Pen Display and reported how very disappointed I was in the $389 tablet monitor. I’ve been meaning to post this follow up review ever since, but I’ve kept checking the Monoprice and Huion sites weekly hoping for signs of a new set of Windows drivers that could vastly improve this device. Unfortunately, the only driver download available from Monoprice dates back to October and the product manager with whom I’ve corresponded hasn’t been able to confirm whether any updates are even in the pipeline. The Monoprice’s drivers appear to be rebadged Huion drivers for its GT-190 tablet display. I am not 100% certain that the drivers are identical, but except for logos, the drivers’ control panels are exactly the same. The Huion archive was updated in December, so I am currently running that driver version. However, except for the English language product manual, the other files in the .zip are dated 2012 and earlier. Neither the Monoprice nor Huion archives contain Windows 8.x-specific drivers, so it doesn’t appear that any software development is occurring on the Windows side. And boy, does the Monoprice Interactive Pen Display need it! As I wrote in my unboxing, this tablet monitor makes a very good first impression given its low price. Packaging is professional, industrial design is very nice, build quality is excellent and the rubberized stylus has a nice size and feel. Unfortunately, it all goes downhill from there. Cable connections are in the lower back of the monitor and face downward. You’ll have to hold the display upside down to attach either the included VGA or optional DVI cable as well as the USB cable for pen input. You’ll also need to be careful about how the cables are threaded out of the back as they tend to interfere with the monitor’s stand. Suffice it to say I didn’t follow these directions and it caused a lot of wasted time and hair pulling. So to summarize: the pen display won’t work in multi-monitor mode in Windows. Install the drivers first. Unplug your current monitor and plug in the Monoprice. Start up your system and set the resolution. 1440 x 900 is maximum, but don’t be surprised if your video card doesn’t support those dimensions (a couple of the machines I tested didn’t but the display worked ok in a lower res). Lastly, connect the USB cable from the display to your pc. The pen drivers should install automatically. I don’t recall if it’s required, but to be safe you’ll want to reboot your pc after the pen driver installation. Your pen will also need charging out of the box, so be prepared to plug it in to another USB port via the supplied (but too short) cable. Charging will take an hour, but thankfully I’ve only had to do it once over the two months I’ve owned the device. By default, the pen drivers will display an icon in your system tray. Left clicking on the icon will load up the control panel. You can also access the control panel directly under Control Panel\Tablet Setting. Don’t be surprised if your system doesn’t seem to respond to your pen’s taps. Using the Monoprice drivers, default clicking sensitivity was set too low. No matter how hard I pounded with the pen, I couldn’t get clicks to register. (You’ll want to keep a mouse handy in case this happens to you). Changing the click pressure setting in the control panel corrected this issue. With the Huion driver I’m currently using I didn’t experience the problem, though I still had to set click sensitivity all the way to Heavy in order to get maximum range of pressure. Once you’ve got it set correctly, pressure sensitivity on the pen display is amazing. I don’t know if anyone has the hand control to draw at a specific pressure level every time, but my ham fists are able to get a great range as illustrated below. The control panel's calibration purports to offer three calibration options from 4 points to 25 points. DO NOT TOUCH THIS!!! Once you attempt to calibrate your display, your pen will only work on one half of your screen and touch targets will be off by several inches. Twenty-five point calibration sounds great, but you'd better untick that Calibration box is you want to be able to use the pen display at all! I verified this problem on four different machines, including one running Windows 7. Fortunately (using a mouse) it’s easy to ignore the calibration by going back in to the control panel and un-ticking the calibration box. I’ve already bemoaned the atrocious viewing angles of the Interactive Pen Display during my unboxing. The only decent angle is nearly upright at about 80 degrees. If you’re not comfortable working at that angle, I’d advise forgetting about the Monoprice. I like to rest my hand on the drawing surface and generally work with no more than a 10 or 20 degree incline so it’s been pretty painful to acclimate to this new approach. Color reproduction is hideous. A tiny move of the head will result in wildly different colors. Adjusting the display gamma with my video card software improved color display a bit, but I wouldn’t advice doing much color work without testing on another monitor. My unit also has two small areas with dirt under the glass. They could be easily mistaken for dead pixels, but if I look at them from the side, it's apparent that they appear to be specs of dust floating between the digitizer layer and the display. OS X users can use the Interactive Pen Display in multi-monitor mode so the low resolution and display issues are easier to ignore. But since you can’t even mirror your display on Windows, the pen display must be your main monitor. I’ve actually been using it this way for the past month, setting aside a gorgeous 23-inch high res Dell display that I normally use on my desktop. I lived with 19-inch TTF monitors in the past and you eventually get accustomed to the display’s limitations. Nevertheless it’s kind of ridiculous to have to adapt one’s entire workspace and work habits to accommodate a piece of low end hardware. After reading this you may ask why I didn’t return the Monoprice for a refund within the 30-day grace period. I certainly should have, but I keep hoping that some future driver update will correct the most egregious Windows issues. And, at the very least, my daughter will have a low-end Cintiq pretender to use with her MacBook Pro when she’s out of school in the spring. If you’re on a tight budget, the Interactive Pen Display is still worth considering, especially for Mac artists. Despite its limitations, it certainly beats drawing on an Intuos tablet that could cost the same or more. For Windows artists, the pen display is a much harder sell. Now that the price of the original Surface Pro has dropped to $599, I’d definitely recommend it over the Monoprice. But if money is tight and you haven’t taken a plunge on a Windows tablet or convertible, or if you absolutely must have a larger workspace, the Interactive Pen Display is worth considering. But please make sure you go in with eyes wide open and expectations in check. The device has been in short supply since it was released in early December. The Monoprice site currently says it’s back-ordered until April. So perhaps the manufacturers have gone back to the drawing board and are ironing out some of the hardware issues. But until they publish new drivers, the Interactive Pen Display will satisfy only the most forgiving of Windows artists. Never has that memorable quote from Bambi's pal Thumper felt so appropriate. Like most of you, I've been eagerly awaiting the arrival of the new Monoprice Interactive Pen Display since it was released last month. Though I just got the Yiynova MVP22U, I couldn't pass up the offer of an under $400 tablet monitor with similar capabilities, especially coming from a trusted name like Monoprice from whom I've purchased many cables and thingamajigs over the years. To add to that excitement, expert artist and trusted tablet guru Ray Frenden posted his own very positive review of the device this weekend. So when it arrived this morning, I quickly trumpeted the fact on Twitter and set out to do my usual quick unboxing and first impressions post. But here it is eight hours after its arrival and I'm regretting my words. I love technology. I know this stuff is almost magical. And when it doesn't work as expected or as others have led me to believe it would, I feel a deep sense of disappointment. And this tablet monitor may be the most disappointing device I've ever used. Why? Because I know UC Logic digitizers deliver (see my Yiynova posts). Because Ray Frenden has written very highly of Huion, the Chinese manufacturer who builds the other tablets sold by Monoprice. Because it looked so good out of the box: nothing cheap or homemade about this device. But then I had to go and power it on. Frenden's review mentions that viewing angles are bad and even recommends using the display on a monitor arm. But in my estimation, the Interactive Pen Display only seems to have one acceptable viewing angle: head on. The slightest tilt immediately results in color and brightness shifts that are readily apparent and reproducible (see photos below). The rest of the issues I've had are software related and I've reached out to Monoprice to see if I can access development drivers that work better than the ones shipped in the box or that are available for download on the Huion website. Suffice it to say that the Windows 8.1 experience so far has been pretty painful. I won't elaborate until I hear back and will update this post as soon as I do. The Monoprice Interactive Display ships in an attractive box that promises a professional experience. The 19-inch pen display includes Mac and Windows manual, a driver installation CD, the pen and holder, a power supply, power cord, USB pen charging cable, VGA cable and USB cable. Out of the box, the tablet monitor is as attractive and well-made as any higher end display. The VESA stand provides a wide variety of support angles. Unfortunately, color representation is not accurate at this angle. This is the monitor stand's most upright position, just shy of 90-degrees. I don't like to work with the monitor at this angle, but it is the only that delivers an accurate color display. The pen and holder are wonderful, much better than the stylus that ships with the Yiynova. The entire pen is rubberized and the buttons are firm. No extra nibs or nib extractor is included. The pen is battery powered and rechargeable. The connectors (USB, power, VGA and DVI) are a little hard to reach. You'll want to set the monitor on its face to plug everything in. Unlike the Yiynova, all the buttons are easily accessible and located on the front lower right corner. Connected to the Surface Pro without a docking station, the USB and VGA cables can be unsightly. I am using a miniDisplay to VGA adapter. The resolution of the Surface Pro has to be lowered to 1440x900, the pen display's maximum resolution. Mac users do not have to mirror their displays. This is a Windows only limitation. You can see some of the color banding in the darker colors on the upper right of the Monoprice screen. On the Surface Pro screen above, note how the color is uniform from top of the display to the bottom. At approximately the same angle, note how the colors shift on the Monoprice. This is a typical screen shot head-on. Colors are saturated and even. But looking down from above or from any other angle, that same screen fades to white. I'm hoping that Monoprice will point me (and you) to development drivers. The default click sensitivity is set so light that any tap results in 100% pressure. The pen display is supposed to work with Windows 8 automatically, but the pressure setting makes it impossible to double click on any items. The pen only becomes usable as a navigation device with the drivers installed. Unfortunately, this conflicts with the Surface Pro's Wacom drivers, so the two cannot be used at once. For the rest of my driver tests, I was using a non-touch Windows 8.1 laptop. The drivers also allow 4-, 9- and 25-point calibration. But the calibration didn't work on my system. Before I could click the upper left calibration point, it would click itself. The results were unusable. Fortunately, you can turn the calibration off by unticking the box. UPDATE: We've got our own unboxing and (disappointed) first impressions here. I expect to get my Monoprice Interactive Pen Display to review next week, but tablet guru Ray Frenden got his a few days early. This should be an excellent option for you Mac owners out there. Windows users beware that the device can only run in mirror mode, so you will have to run your pc in 1440 x 900 mode to use it. Apple users will not have that limitation.